The New Testament expression “there will be weeping and gnashing of teeth” is a puzzling one, and one which has engendered fear into generations of believers. It’s an image associated with being “cast into outer darkness” and rejection, and is a favourite of “hell-fire and brimstone” preachers, and is often quoted as an image of the torments of hell. But what exactly is “gnashing of teeth?” The Greek word that is translated as “gnashing” (βρυγμός) is from a word that means “to bite” and describes the snarling of a wild animal as it attacks. The Septuagint uses this word in Proverbs 19:21 to translate the Hebrew word נַהַם used to describe the growling or snarling of a lion (different to the word used for the roaring of a lion, which is שָׁאַג). In all of the passages where the Greek terms for gnash or gnashing are used in the New Testament or in the Septuagint they are always used of anger, rage, pain or anguish. They are never used of sorrow, grief, remorse or regret. The expression “weeping and gnashing of teeth” occurs only seven times in the Bible: six are found in the gospel of Matthew, one in Luke. I say to you that many will come from the east and the west, and will take their places at the feast with Abraham, Isaac and Jacob in the kingdom of heaven. But the subjects of the kingdom will be thrown outside, into the darkness, where there will be weeping and gnashing of teeth. (Matthew 8:11-12). The Son of Man will send out his angels, and they will weed out of his kingdom everything that causes sin and all who do evil. They will throw them into the fiery furnace, where there will be weeping and gnashing of teeth. (Matthew 13:41-42). This is how it will be at the end of the age. The angels will come and separate the wicked from the righteous and throw them into the fiery furnace, where there will be weeping and gnashing of teeth. (Matthew 13:49-50). ‘Friend,’ he asked, ‘how did you get in here without wedding clothes?’ The man was speechless. Then the king told the attendants, ‘Tie him hand and foot, and throw him outside, into the darkness, where there will be weeping and gnashing of teeth.’ (Matthew 22:12-13). The master of that servant will come on a day when he does not expect him and at an hour he is not aware of. He will cut him to pieces and assign him a place with the hypocrites, where there will be weeping and gnashing of teeth. (Matthew 24:50-51). For everyone who has will be given more, and he will have an abundance. Whoever does not have, even what he has will be taken from him. And throw that worthless servant outside, into the darkness, where there will be weeping and gnashing of teeth. (Matthew 25:29-30). But he will reply, ‘I don’t know you or where you come from. Away from me, all you evildoers!’ There will be weeping there, and gnashing of teeth, when you see Abraham, Isaac and Jacob and all the prophets in the kingdom of God, but you yourselves thrown out. (Luke 13:27-28). When they heard these things, they were cut to the heart, and they gnashed on him with their teeth (Acts 7:54). This is the only passage in the New Testament where the verb “gnash” is used and it is a significant passage because it sheds light on the meaning of the associated noun “gnashing of teeth.” This verse describes an incident where the religious leaders were furious with Stephen, the first follower of Jesus to be martyred. Apparently full of anger and hatred at Stephen’s teaching, their rage soon led to them stoning him. To “gnash the teeth” as it is used in this passage has nothing to do with sorrow or regret or grief or remorse. It describes their anger and hatred. They are described as being like angry growling animals about to devour their prey. We should firstly note that in these sayings Jesus envisages a future time, “the end of the age”, and not something immediately following death. When speaking about “the kingdom” his emphasis was almost invariably on a future period, what is often called the ‘Age to Come’ (Hebrew עולם הבא, or ‘world to come’), or the ‘Messianic age’, although he also taught about how this future time has implications for the present. We would be hard pressed to find any teachings of Jesus which explicitly refer to an intermediate stage between death and this future Messianic age. 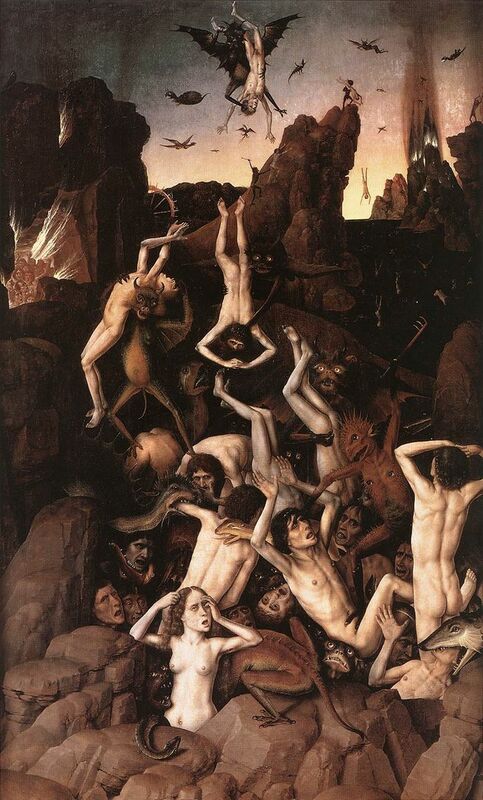 While many of the images from the sayings listed above are popularly used to describe the torments of hell following death, the original context in the gospels is about some event “at the end of the age”. One of the occasions when Jesus used this expression was in the context of speaking about the “sons of the kingdom”, or citizens of the Kingdom (the NIV has “subjects of the kingdom”). The background to this saying was an encounter with a Roman centurion – someone outside of God’s chosen people Israel – and Jesus said of him ” I have not found so great faith, no, not in Israel.” He then went on to say that while many would come from outside and sit down with Abraham, Isaac and Jacob in the kingdom, the “children/sons/subjects of the kingdom” would be cast into outer darkness where there would be weeping and gnashing of teeth. It is evident that he is saying outsiders (such as this Roman centurion) would be welcomed into the kingdom while those who thought the kingdom was their “right” would be rejected. When we look at some of the other similar sayings of Jesus we see that he did not argue that all Israel who would be cast out, but only a particular class within Israel. It was not only “Gentiles” who were “outsiders”. The Pharisees and religious leaders also excluded people with disabilities (the blind, the crippled, the deaf), those with infectious diseases such as leprosy, people who colluded with the Romans (such as tax-collectors), people who didn’t measure up to their standards of holiness or who rejected some of their doctrines (the term “sinners” included people who disagreed with them as well as those who were guilty of breaking the Law) as well as Samaritans and Gentiles. In fact, they took the name “Pharisees” precisely because it meant “the separated” – those who were “pure in doctrine and conduct”. Consequently many of Jesus’ sayings and stories were directed against this elite class within Israel: the religious leaders, the pure, the separated, those who felt that they alone were the “true Israel”. For example, after Jesus told the parable of the talents Mark and Luke tell us that “the teachers of the law and the chief priests … knew he had spoken this parable against them” (Mk 12:12; Lk 20:19). In these sayings Jesus is saying that it was those who were regarded by the religious leaders as being “outsiders”, those whom they rejected, that are to be made welcome in the Kingdom. On the other hand, the “insiders”, the doctrinally pure, those who have separated themselves from the ones who don’t measure up doctrinally or in their behaviour, are to be “cast out”. As a result of being rejected there will be “weeping and gnashing of teeth”. This is not a weeping of remorse or sorrow, but of anger and resentment. This is a technique which is used frequently by Jesus – turning things on their head and saying that the truth is actually the opposite of the popular notion or the teaching of the religious leaders. When Jesus told stories or parables about the kingdom he often referred to some future time in the Age to Come. However, he used these images of the future to make an important lesson about the here-and-now, and how kingdom-people should prepare for this Age to Come. Even when he sais “this is how it will be at the end of the age” the context often suggests that he was drawing lessons about the hear-and-now and how our actions in the present will have implications for the future. So it is that the religious purists who will be rejected “at the end of the age” will go away angrily “gnashing their teeth” with rage because that is how they behave now. In Stephen’s day they directed their anger and rage against this follower of Jesus (and his Greek name suggests that he may have been a Gentile, an “outsider”). Throughout history we have seen “religious” people directing their anger against other believers who don’t measure up to the standards imposed by the purists. Putting this together, we see that the idea behind this expression is that those who are apart from God attack each other and try to tear each other, much like a pack of dogs fighting over a carcass. Without love there is just hatred and envy. According to the gospels, those who do not live by Jesus’ teachings end up biting and tearing each other, while those who live according to God’s way help others, rather than tearing them down. In these stories of Jesus we are being told that the time will come when this class of people will be left to themselves to tear each other apart. But, as with many of Jesus’ teachings about the kingdom, we don’t have to wait until “the end of the age” to see this principle fulfilled. Communities, denominations and churches which splinter and divide often do so because they are obsessed with their own standards of doctrinal purity or so-called holiness rather than reaching out in love to those who are in need of God’s kingdom, and in the process they tear each other apart. In future posts I would like to explore some more biblical imagery commonly associated with hell or the afterlife, especially some of the popular ideas which have moved considerably away from their biblical foundations. This entry was posted in Hell, Resurrection and Afterlife. What an interesting and well written article! Looking forward to the next on Hell,Resurrection and Afterlife.Thanks Stephen.